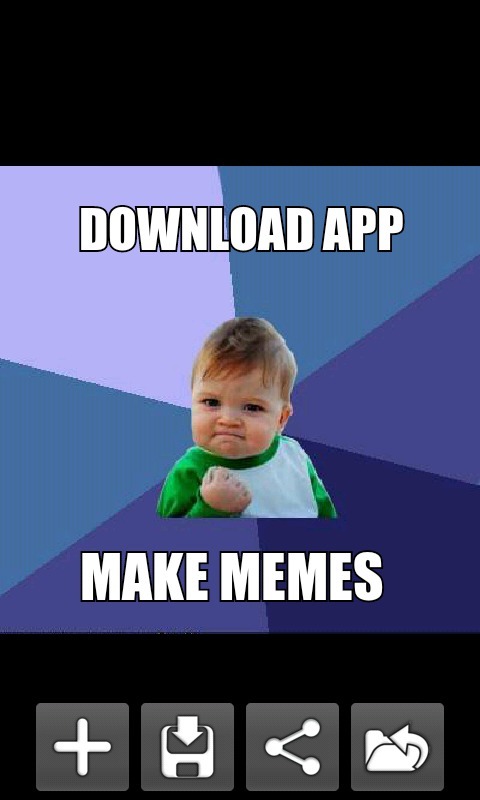 Advice Animal Creator is an application that lets you create meme images on your phone. Advice Animals, sometimes referred to as "Advice Dog spin-offs", are a type of image macro series featuring animals of some kind (including humans) that are accompanied by captioned text to represent a character trait or an archetype that fits the role of a "stock character". Select an image, add some text, and share away! You can either use your own image to create your unique meme, or select one of the 100+ built-in images. Very simple controls, and intuitive usage. Includes more than one hundred of the most popular memes! Do you have an advice? Say it with Advice dog. Any conspiracy theories? Conspiracy Keanu is here to ponder! Do you have a scumbag friend? Tell about him with Scumbag Steve! There are so many others to choose from! This application is ad supported, and features a banner ad (only if connected to the internet).